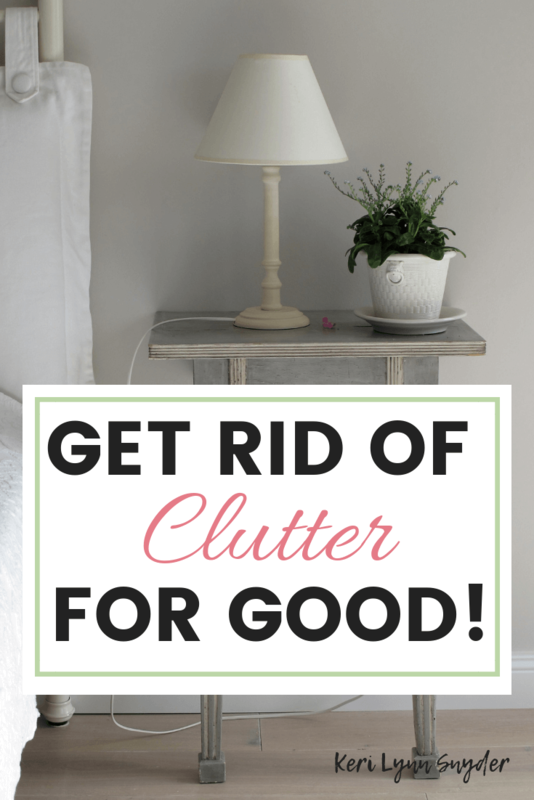 Learn how to keep the clutter away once and for all! I’m sharing my tips for a decluttered and organized home. You have been decluttering your home and now the big question is, how to keep the clutter away? I am sure we have all done the decluttering before only to have the clutter creep back in within a month. The once decluttered entry way becomes filtered with shoes, socks, and old mail. We never intend for this to happen, but eventually our house is right back to where it was cluttered. In a desperate attempt to regain control, you declutter again only for the cycle to repeat itself. I know it has been the tune of my life for far too long. However, it does not have to be that way. We can declutter our homes once and for all. We just need to have some systems set in place. 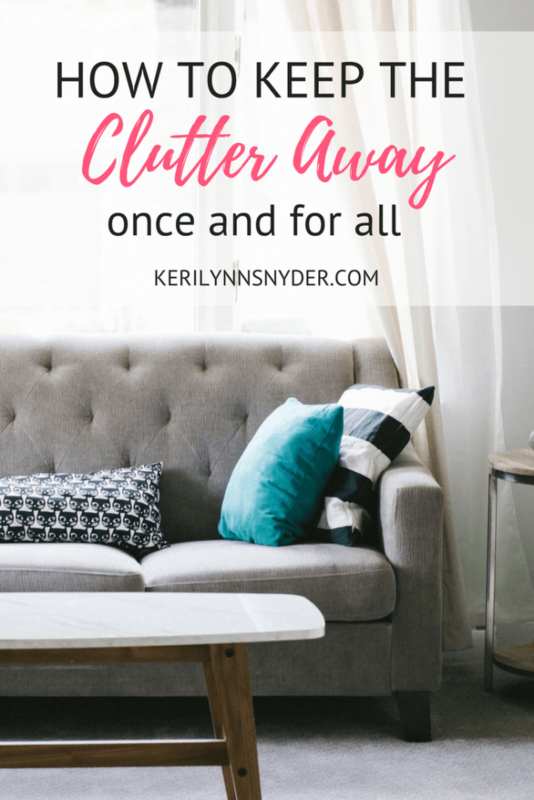 How to keep the clutter away- once and for all! If you are trying to maintain your home all on your own, you are going to end up stressed out and overwhelmed. A few months ago I was complaining about the clutter in my boys’ room. As I started to clean it up, I stopped myself and called the boys in. If we do not involve our families, we cannot keep the clutter away. Sit down with your family and talk about basic routines and then implement them. It is going to take A LOT of repetition but is worth it. Put things away right away. Clutter happens because we put things where they do not belong, saying we will do it later. We all know that later usually never comes. As soon as you get the mail, go through it. Put the bills where you keep them and recycle everything else. Put the laundry where it belongs. Take the extra minute to do it now to keep it from becoming a larger task later. Do a daily clean up. This is key to keeping the clutter away. At the end of every day go through your home for a daily clean up. You can involve your whole family and give each person a room or walk through the rooms together. Gather what does not belong and put it back. Emily Ley shares in her book A Simplified Life how her and her husband use a white laundry basket to gather up all of the random items around the house. Then the put everything back together. This has become a daily routine for them and it is brilliant! The basket for the shoes, the clipboards for the school papers, the daily to do list, all of these are great systems, but only if we use them. I am great at setting up systems but not always great at following through. Realizing this has helped me to be more intentional in this area. I also know I need to keep systems super simple. You can declutter your home and keep the clutter away. It just takes daily work. However, when we put in the little daily tasks, we are able to cultivate lives of intention. I think the harder part is keeping the clutter away versus actually de cluttering. Love the laundry basket idea-and how nice for the spouse to join in. Great article! I’m the queen of clutter. Haha hope it is helpful!! Great reminders! I especially need to work on putting things away right away… saves so much work in the long run. Yes it does! It can be so hard though!